The Management Development Institute (MDI) has been specifically developed to provide middle managers with the skills they need to take their careers to the next level. This program consists of three sessions during which attendees learn through lectures, case studies, roundtable discussions, expert panels and guest speakers. All sessions will take place at the FIA offices in Cleveland, Ohio. 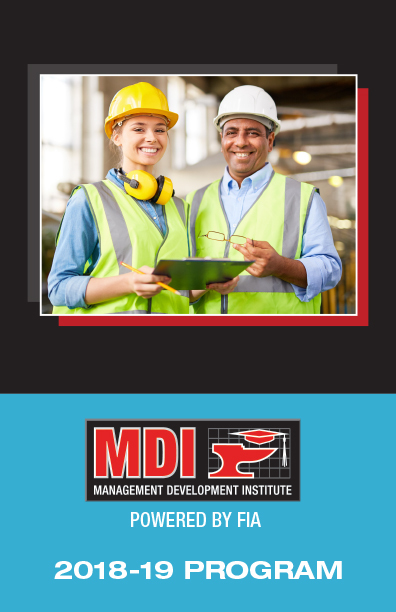 Click on the image below to view the 2018-19 MDI program brochure. To register for the Management Development Institute, click here or complete the registration form and return it to Kathy Edwards at kathy@forging.org or fax it to 216-781-0102.